Set off on a half-day hike with a guide who will customize the route to suit your interests and ability. 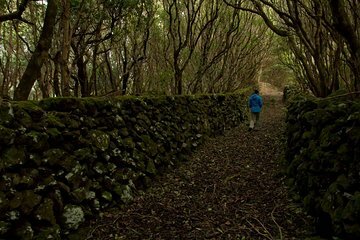 Get picked up at your hotel in either the morning or afternoon and driven to the trail, where you will begin your walk through the dramatic Azorean landscape. Your guide will enrich the experience by offering information about the history—both natural and cultural—of the area. This was an awesome tour. It's definitely not for the faint of heart, we were a group of young people so were able to manage. At this time of year March there was a lot of mud and periods of rain, felt super all terrain. Our guide was incredible, telling us so much about the history, ecosphere and economy of the island. Highly recommend! Wonderful hike along the coast with beautiful vistas. Our guide was careful to select a hike suited to the weather and our ability. The guide came to our hotel the day prior to make sure we were comfortable with the itinerary. We loved Terceira.